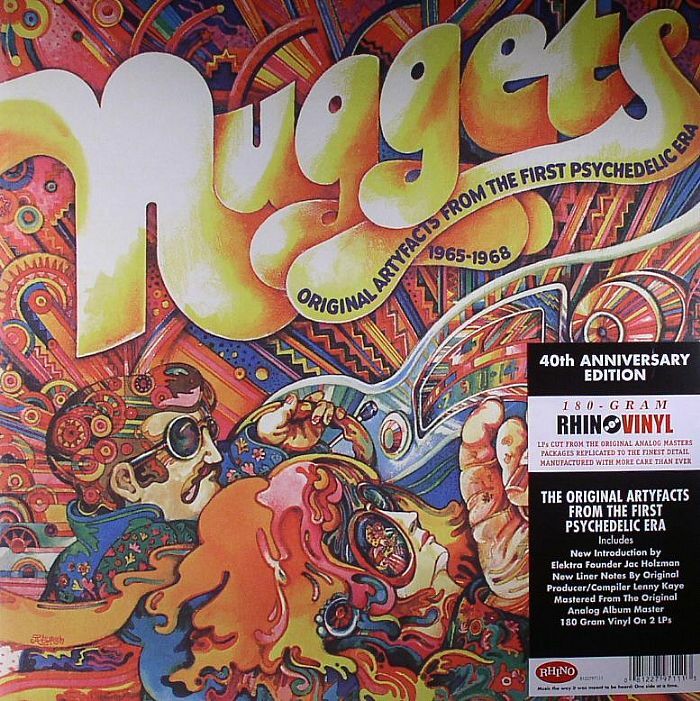 VARIOUS Nuggets: The Original Artyfacts From The First Psychedelic Era 1965 1968 (40th Anniversary Edition) vinyl at Juno Records. 1. The Electric Prunes - "I Had Too Much To Dream (Last Night)"
2. Dirty Water - "The Standells"
3. The Strangleloves - "Night Time"
4. The Knickerbockers - "Lies"
5. The Vagrants - "Respect"
6. Mouse - "A Public Execution"
7. The Blues Project - "No Time Like The Right Now"
1. The Shadows Of Knight - "Oh Yeah"
2. The Seeds - "Pushin Too Hard"
3. The Barbarians - "Moulty"
4. The Remains - "Don't Look Back"
5. The Magicians - "Invitation To Cry"
6. The Castaways - "Liar Liar"
7. The Thirteenth Floor Elevators - "You're Gonna Miss Me"
1. 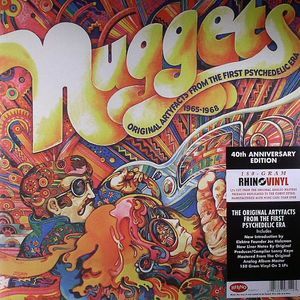 Count Five - "Psychotic Reaction"
2. 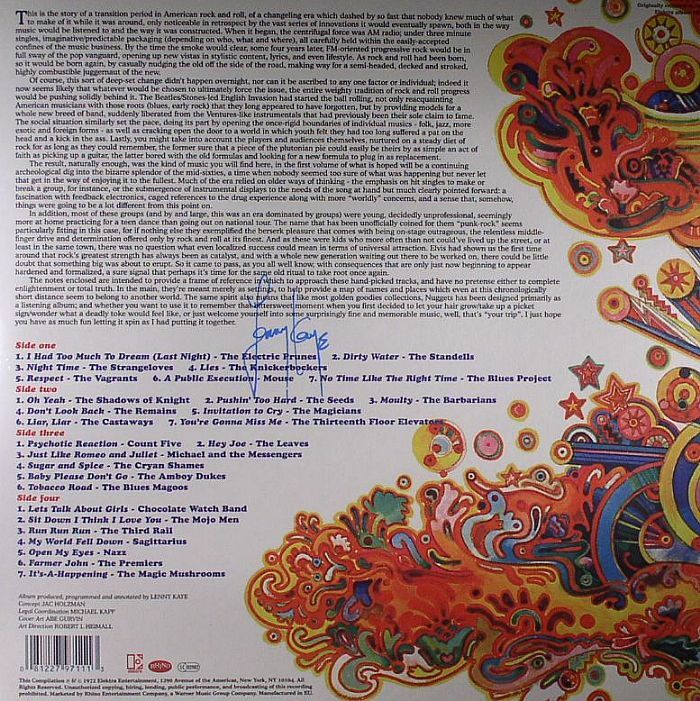 The Leaves - "Hey Joe"
3. Michael & The Messengers - "Just Like Romeo & Juliet"
4. The Cryan Shames - "Sugar & Spice"
5. The Amboy Dukes - "Baby Please Don't Go"
6. The Blues Magoos - "Tobacco Road"
1. Chocolate Watch Band - "Lets Talk About Girls"
2. The Mojo Men - "Sit Down I Think I Love You"
3. The Third Rail - "Run Run Run"
4. Sagittarius - "My World Fell Down"
5. Nazz - "Open My Eyes"
6. The Premiers - "Farmer John"
7. The Magic Mushrooms - "It's A Happening"